Fallahnezhad, M., Golbafian, V. (2016). Effects of inspection errors on economically design of CCC-r control chart. Journal of Industrial Engineering and Management Studies, 3(2), 1-16. M.S. Fallahnezhad; V. Golbafian. "Effects of inspection errors on economically design of CCC-r control chart". 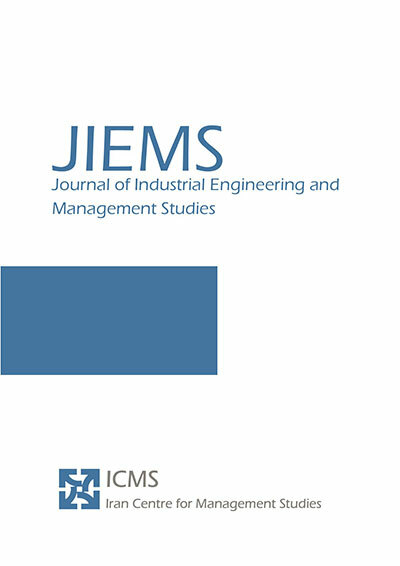 Journal of Industrial Engineering and Management Studies, 3, 2, 2016, 1-16. Fallahnezhad, M., Golbafian, V. (2016). 'Effects of inspection errors on economically design of CCC-r control chart', Journal of Industrial Engineering and Management Studies, 3(2), pp. 1-16. Fallahnezhad, M., Golbafian, V. Effects of inspection errors on economically design of CCC-r control chart. Journal of Industrial Engineering and Management Studies, 2016; 3(2): 1-16. CCC-r chart extended approach of CCC charts, is a technique applied when nonconforming items are rarely observed. However, it is usually assumed that the inspection process is perfect in the implementation control charts imperfect inspections may have a significant impact on the performance of the control chart and setting the control limits. This paper first investigates the effect of inspection errors on the formulation of CCC-r chart, then an economic model is presented in the presence of inspection errors to design control chart so that the average cost per item minimized. The r parameter in the chart is optimized with respect to the economic objective function, Modified Consumer Risk, and Modified Producer Risk. Acosta-Mejia, C. A., 2012, “Two-sided charts for monitoring nonconforming parts per million”, Quality Engineering, 25(1), 34-45. Acosta-Mejia, C. A., 2014, “Two-sided charts for monitoring nonconforming parts per million”, Quality control and applied statistics, 59(1), 17-18. Albers, W., 2010, “The optimal choice of negative binomial charts for monitoring high-quality processes”, Journal of Statistical Planning and Inference, 140(1), 214-225. Ali, S., Pievatolo, A., & Göb, R., 2016, “An Overview of Control Charts for High‐quality Processes”, Quality and Reliability Engineering International. Bersimis, S., Koutras, M. V., & Maravelakis, P. E., 2014, “A compound control chart for monitoring and controlling high quality processes”, European Journal of Operational Research, 233(3), 595-603. Burke, R. J., Davis, R. D., Kaminsky, F. C., & Roberts, A. E., 1995, “The effect of inspector errors on the true fraction non-conforming: an industrial experiment”, Quality Engineering, 7(3), 543-550. Calvin, T. W., 1983, “Quality Control Techniques for Zero Defects”, Components, Hybrids, and Manufacturing Technology, IEEE Transactions on, 6(3), 323-328. Chan, L. Y., Lai, C. D., Xie, M., & Goh, T. N., 2003, “A two-stage decision procedure for monitoring processes with low fraction nonconforming”, European Journal of Operational Research, 150(2), 420-436. Chen, S. L., & Chung, K. J., 1994, Inspection error effects on economic selection of target value for a production process. European Journal of Operational Research, 79(2), 311-324. Di Bucchianico, A., Mooiweer, G. D., & Moonen, E. J. G., 2005, “Monitoring Infrequent Failures of High‐volume Production Processes”, Quality and Reliability Engineering International, 21(5), 521-528. Duncan, A. J., 1956, “The economic design of X charts used to maintain current control of a process”, Journal of the American Statistical Association, 51(274), 228-242. Emura, T., & Lin, Y. S., 2015, “A comparison of normal approximation rules for attribute control charts”, Quality and Reliability Engineering International,31(3), 411-418. Fallahnezhad, M.S., & Golbafian, V., 2015, “Economic design of CCC-r control charts based on Average Number of Inspected items”, To appear in Scientia Iranica. Joekes, S., Smrekar, M., & Righetti, A. F., 2016, “A comparative study of two proposed CCC-r charts for high quality processes and their application to an injection molding process”, Quality Engineering, 28(4), 467-475. Johnson, N. L., Kotz, S., & Wu, X. Z., 1991, “Inspection errors for attributes in quality control”, Vol. 44. Khilare, S. K., & Shirke, D. T., 2014, “The steady-state performance of cumulative count of a conforming control chart based on runs rules”, Communications in Statistics-Theory and Methods, 43(15), 3135-3147. Liu, J. Y., Xie, M., Goh, T. N., & Ranjan, P., 2004, “Time-between-events charts for on-line process monitoring”, In Engineering Management Conference, 2004. Proceedings. 2004 IEEE International, Vol. 3, pp. 1061-1065. Lorenzen, T. J., & Vance, L. C., 1986, “The economic design of control charts: a unified approach”, Technometrics, 28(1), 3-10. Lu, X. S., Xie, M., & Goh, T. N., 2000, “An investigation of the effects of inspection errors on the run-length control charts”, Communications in Statistics-Simulation and Computation, 29(1), 315-335. Ranjan, P., Xie, M., & Goh, T. N., 2003, “Optimal control limits for CCC charts in the presence of inspection errors”, Quality and Reliability Engineering International, 19(2), 149-160. Ryan TP., 2011, “Statistical methods for quality improvement”, John Wiley & Sons. Suich, R., 1988, “The c control chart under inspection error”, Journal of Quality Technology, 20(4), 263-266. Xie, M., Goh, T. N., & Lu, X. S., 1998, “A comparative study of CCC and CUSUM charts”, Quality and Reliability Engineering International, 14(5), 339-345. Xie, M., Goh, T. N., & Kuralmani, V., 2012, “Statistical models and control charts for high-quality processes”, Springer Science & Business Media. Xie, M., Lu, X. S., Goh, T. N., & Chan, L. Y., 1999, “A quality monitoring and decision-making scheme for automated production processes”, International Journal of Quality & Reliability Management, 16(2), 148-157. Yang, Z., Xie, M., Kuralmani, V., & Tsui, K. L., 2002, “On the performance of geometric chart with estimated control limits”, Journal of Quality Technology, 34(4), 448. Yazdi, A. A., Nezhad, M. S. F., Shishebori, D., and Mostafaeipour, A., “Development of an Optimal Design for Conforming Run Length Sampling Methods in the Presence of Inspection Errors,” Journal of Testing and Evaluation, Vol. 44, No. 5, 2016, pp. 1885–1891, doi:10.1520/JTE20140478. Yazdi, A. A., & Nezhad, M. S. F., 2016, “Comparison between count of cumulative conforming sampling plans and Dodge-Romig single sampling plan”, Communications in Statistics-Theory and Methods, (just-accepted), 00-00. Yılmaz, Ş., & Burnak, N., 2013, “An Economic Approach to the Management of High‐Quality Processes”, Quality and Reliability Engineering International, 29(5), 681-690. Zhang, H. Y., Xie, M., Goh, T. N., & Shamsuzzaman, M., 2011, “Economic design of time-between-events control chart system”, Computers & Industrial Engineering, 60(4), 485-492.